The United Nations Framework Convention on Climate Change (UNFCCC) will be hosting the 21st UN Climate Change Conference of Parties (COP) in Paris in December this year. 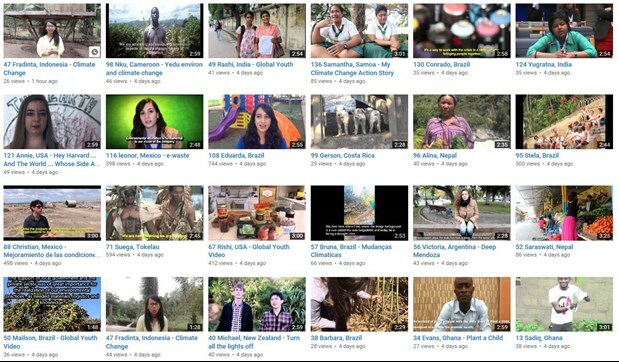 As the international community is gearing up to conclude a new, universal climate change agreement in December in France, the UNFCCC invites all global citizens to help decide which young video reporter will be on location to capture some of the most exciting moments of the Paris UN Climate Change Conference (COP 21). As part of the Global Youth Video Competition on Climate Change, young people from around the globe have been invited to share what they are doing to combat climate change, for example convincing their parents, school or college to take climate action, or taking part in a campaign. Two winners of the top videos will be invited to join the UNFCCC communications team at COP 21 as videographers and reporters. A total of 130 entries were received by the UNFCCC out of which 24 have been shortlisted. One winner among these will be selected by a specialist jury and one by public vote. The UNFCCC therefore urges citizens from around the world to help select the publicly voted winner from these 24 shortlisted. This winner will be chosen based on the highest number of views their video receives during the voting period. The Views will be counted until September 17, 2015. You can therefore support your favorite video by visiting the tve YouTube channel by clicking here. Click and view the video below to support the youth from India! The winner of this Climate Video competition will be announced on Carbon Neutral Day, 23 September in New York during Climate Week. On 3 December 2015, which is Young and Future Generations Day at COP 21, we’ll showcase youth power at a Global Youth Video Competition award ceremony, where both winners will talk about their inspirational stories. The video competition has been made possible through a partnership between the UNFCCC, the GEF Small Grants Programme implemented by UNDP, and Television for the Environment- tve.